The Fatal Four Pack, a mystery anthology with me (Rae Davies), Deb Baker, Lorraine Bartlett and Patricia Ryan is continuing to chug along and bring in much needed $$ for the Cystic Fibrosis Foundation. I just sent the latest check and the total donation so far is $3,630.44! Another thousand or so should be going their way in the next few weeks, on top of this number! Many thanks to everyone who has purchased the anthology (ONLY 99 cents for four full length books) or shared information on it with their mystery-loving friends! 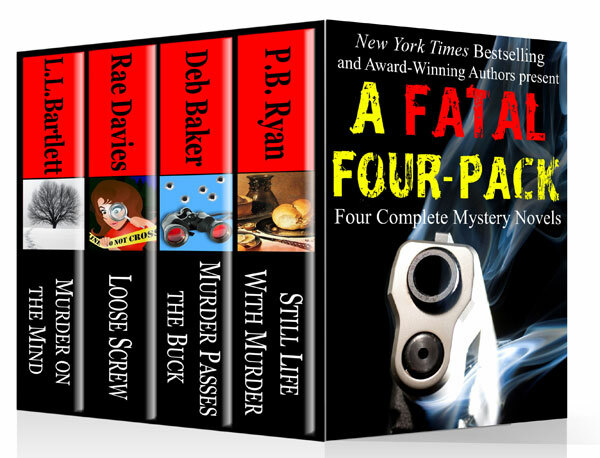 I (as Rae Davies) have teamed up with three great mystery authors to offer A Fatal Four Pack. Four great reads at a great price for a great cause! ALL author proceeds go to the Cystic Fibrosis Foundation. Get the bundle for only 99 cents! When her neighbor is shot and killed, sixty-six-year-old widow Gertie Johnson seizes the opportunity to move on with her life by investigating his death. Gertie is abetted (and hindered) by her grandson Little Donny, man-hungry best friend Cora Mae, and word-of-the-day challenger, Kitty. It doesn’t help that the death has been ruled an accident by the sheriff of this backwoods community in Michigan’s Upper Peninsula. Or that Sheriff Blaze Johnson happens to be Gertie’s son. Whether it’s interrogating neighbors, spying, or impersonating the FBI—not to mention staying one step ahead of Blaze—Gertie will do whatever it takes to solve the case, even when the killer takes aim at her. After insurance investigator Jeff Resnick is viciously mugged, he discovers the resulting brain injury has left him able to sense people’s secrets. When his estranged half-brother, Richard, takes Jeff to the family home to recover, Jeff’s senses pick up clues to the recent vicious murder of a local banker. Despite Jeff’s mixed feelings about his new sixth sense, he feels compelled to explore the banker’s murder–using both his senses and his investigative skills, along with Richard’s reluctant help. Against the gritty setting of wintry Buffalo, NY, and a tormented family history of his own, unraveling the truth threatens Jeff’s–and Richard’s–life.